You get a lot for your $6.95 each month. Now see how far another $6.95 could go! The Season of Giving is back! For the past few years, we have been using our show and the unique platform it provides to help various charitable causes. In 2016, we started raising funds for the Derek and Romaine Internship program which launched last year. With the help of a very generous start grant and in partnership with the Ali Forney Center and the NY LGBT Center we have been able to offer several homeless LGBT youth a paid internship. We love these interns! Not only do they truly appreciate the opportunity to learn more about LGBT media but they are so grateful for the chance to increase their professional work place skill set. Interns on Derek and Romaine are put through the ringer with the many tasks that we ask them to learn. They are engaged in virtually every aspect of the show from helping to produce guest segments to editing shows. Each intern has a unique set of skills and we attempt to train to the intern’s strengths. We can’t imagine the show without these young people piping up in the background and pushing us to teach them more.In 2019, we are looking to expand the skills that we are able to teach our interns by purchasing video broadcasting equipment to help train our interns on the latest video editing technology in addition to the their broadcast editing work. Already one of our former interns has joined us working part time at DNR Studios as a board op on the Taylor Strecker Show, I Love My Wife podcast and Adam Sank Show podcast. We hope even more of our former interns will join us here or at other media companies in the future. But no matter what field they end up finding a career in, these paid interns gain valuable experience putting together a resume, navigating an office environment and building confidence to help transition them from homelessness to independence. Of course none of this could be possible without the help of our incredible listening audience. So how can you help? We have been able to make our paid internship program a reality but we still need to raise additional funds to continue the program. We are thrilled that with the help of the NYC LGBT Center we are able to accept tax-deductible donations. 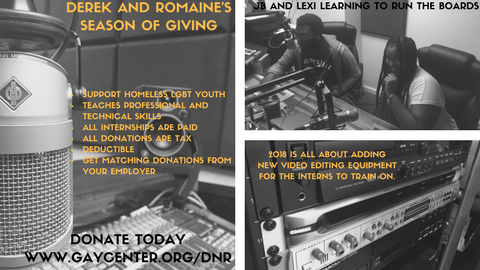 The money you donate will go directly to fund the Derek and Romaine Internship Program. This is your chance to not only help Derek and Romaine, but to help change the lives of the next generation of LGBT youth. Please be a Derek and Romaine angel and join us in this Season of Giving by making your DONATION today. *The DNR Studios holiday greeting card is our way of saying thanks. No purchase or donation is necessary to receive a holiday greeting card. If you don’t wish to make a donation or are unsure if your donation will qualify for a holiday greeting card but would like to receive a card anyway, simply enter your name and mailing address here and you will be added to the DNR Studios holiday greeting card list. Not responsible for lost or stolen mail, incomplete addresses or technical errors. Form must be filled out by 11:59pm ET on Nov 15, 2018. I’m very supportive of the internship program and helping young adults. Happy to donate, and my company matches. Ka-ching!